Mount Prospect police responded about 4:04 P.M. Monday April 10, 2017 to the 100 block of Wimbolton Drive to a report of gunshots heard in the area. Upon arrival, officers checked the vicinity and did not locate any victims, damaged property or evidence supporting the initial complaint and subsequently cleared the scene. At 4:32 P.M., officers were again dispatched to the 100 block of Wimbolton Drive after witnesses now reported seeing a red Mercury Mountaineer drive down the block with the passenger firing a handgun out the window several times. The officers were unable to locate the Mercury, which fled the area prior to police arrival. Multiple 9mm shell casings were recovered on Wimbolton Drive. A witness was interviewed and identified the offender as Jose M. Mendoza. 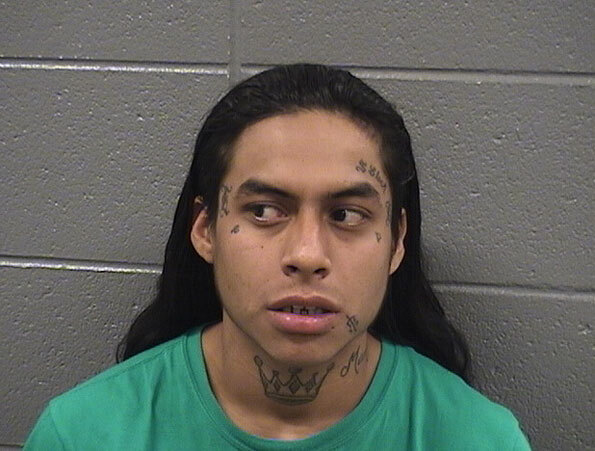 On Wednesday April 12, 2017, the Mount Prospect Police Department arrested and later charged Jose M. Mendoza, 23 years old, of 640 22nd Avenue, Bellwood, IL with one felony count of Reckless Discharge of a Firearm, one felony count of Unlawful Possession of a Firearm by a Felon and one misdemeanor count of Criminal Trespass to Vehicle. Police explained that on Wednesday, April 12, 2017 at approximately 3:00 P.M. a Mount Prospect Police Department patrol officer observed a black Toyota turning onto Euclid Avenue from Wimbolton Drive. The officer recognized a passenger in the Toyota as possibly being Mendoza. A high risk traffic stop was conducted near the intersection of Golf Road and Elmhurst Road. Mendoza was confirmed to be the passenger in the Toyota and was taken into custody without incident. Mendoza was later interviewed at the police department and admitted to firing a handgun multiple times into the air on Wimbolton Drive on April 10, 2017. Apparently the incident was related to a domestic relationship. The Cook County State’s Attorney’s Office approved two felony charges, Reckless Discharge of a Firearm and Unlawful Possession of a Firearm by a Felon, and one misdemeanor charge of Criminal Trespass to Vehicle against Mendoza. The Criminal Trespass to Vehicle charge stemmed from Mendoza using the Mercury Mountaineer without the owner’s consent. On April 13, Mendoza was taken to a bond hearing where his bond was set at $225,000.00 “D”. His next court date is May 5, 2017 at 10:30 A.M. in room 108 of the 3rd District Courthouse of Cook County in Rolling Meadows. Mendoza, 5’5″ 150 LBS, was also charged with one misdemeanor count of domestic battery from a separate incident that occurred in January 2017 in Mount Prospect. Jose Mendoza Reckless Discharge of a Firearm suspect (Law enforecement photo). The public is reminded that criminal charges are not evidence of guilt and that all defendants in a criminal case are presumed innocent unless and until proven guilty in a court of law.